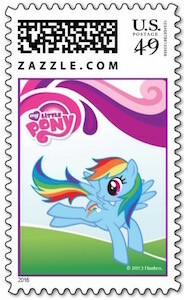 If you like My Little Pony and sending mail then this Rainbow Dash postage stamp is what you need. On the stamp you can see Rainbow Dash running on green grass with a purple cloud with the My Little Pony logo on it. 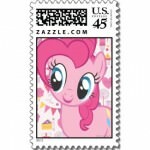 You can get this My Little Pony postage stamp in different values from $0.35 all the way to $6.45 and they come in sheets to so that you can have as many Rainbow Dash stamps as you may need in the value you need for the mail your send. And yes this is a United States Postal Service approved stamp.